Environmental watering over the last five years has initiated migration of the threatened Australian grayling to spawn in the lower Thomson River. One fish was recorded travelling up to 140 km. Fish were found to move long distances, from 62–140 km, during the flows. The fish migrated downstream during environmental watering, near to where the Thomson River meets the Latrobe River, where they spawned. Spawning was detected using drift nets to collect fish eggs 6–10 km upstream from where the Thomson River meets the Latrobe River. The peak in egg collection occurred simultaneously with environmental watering, as Figure 1 shows.4 A valuable lesson was learned in 2016 when the peak flow of environmental water changed from 800 ML a day to 600 ML a day to investigate whether the same response could be generated using less water. No eggs were captured that year, indicating that 600 ML a day is too low for successful spawning. This demonstrates the need to provide river flows of sufficient magnitude and duration to allow adult fish to reach spawning areas. It is also important to maintain river flows and connectivity so they can return to their home range. At times when the flows are not quite right and fish are presumed to stop migrating to the spawning area, multiple water releases may be provided to get the fish moving again, if environmental water is available. Alternatively, suitable natural flows could prompt fish to move again. 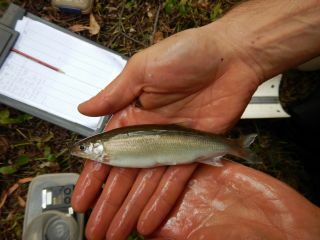 The recovery potential of Australian grayling is determined by multiple factors including marine larval stocks, river flows, food and habitat availability; and these interactions are complex.5 In the last five years, fish ecologists have improved sampling and learned how water volumes affect Australian grayling spawning in the Thomson River 6. This knowledge is being applied to environmental water management. In time, knowledge will increase further and environmental water secured for the Thomson River will be used more effectively to give Australian grayling a brighter future. 1 W. Koster, D. Dawson and D. Crook, 2013, Downstream spawning migration by the amphidromous Australian grayling (Prototroctes mareaena) in a coastal river in south-eastern Australia, Marine and Freshwater Research, 64:31-41. 2 D. Crook, J. Macdonald, J. O'Connor and B. Barry, 2006, Use of otolith chemistry to examine patterns of diadromy in the threatened Australian grayling Prototroctes maraena. Journal of Fish Biology, 69: 1330-1344. 3 F. Amtstaetter, J. O'Connor and A. Pickworth, 2016, Environmental flow releases trigger spawning migrations by Australian grayling, Prototroctes maraena, a threatened diadromous fish, Aquatic Conserv: Mar.Freshw.Ecosyst. 26: 35-43. 4 F. Amtstaetter, J. O'Connor and L. Dodd, 2015, Thomson and Macalister rivers environmental flows monitoring and assessment program: 2015 survey results, Arthur Rylah Institute for Environmental Research Unpublished client report for the West Gippsland Catchment Management Authority, Department of Environment, Land , Water and Planning, Heidelberg, Victoria. 5 D. Schmidt, D. Crook, J. O'Connor and J. Hughes, 2011, Genetic analysis of threatened Australian grayling Prototroctes maraena suggests recruitment to coastal rivers from an unstructured marine larval source population. Journal of Fish Biology: 78, 98-111. 6 F. Amtstaetter, D. Dawson and J. O'Connor, 2015, Improving our ability to collect eggs of the threatened Australian grayling, Prototroctes maraena. Marine and Freshwater Research, 66: 1216-1219.